Which of the 11 objects is the heavier? Fun online physics learning game. 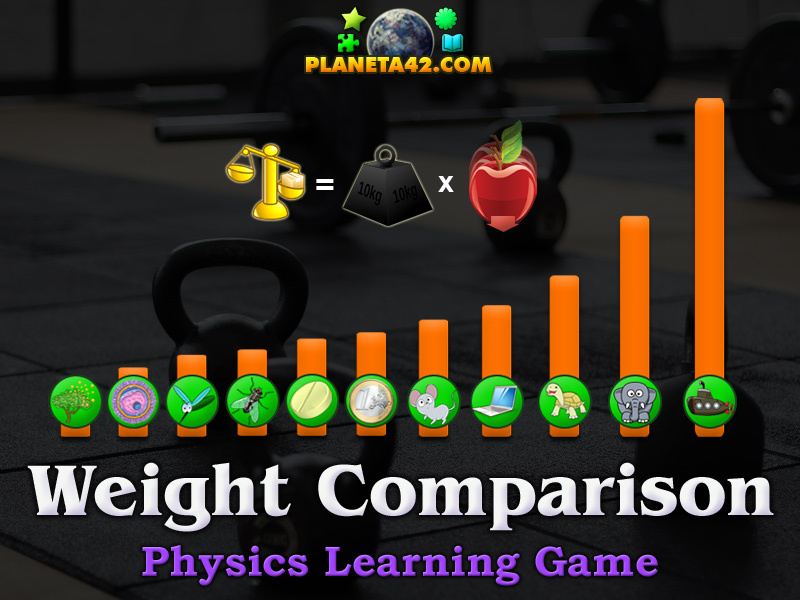 "Weight Comparison" is a free online knowledge level game to sort the objects by their correct weight value in grams. Minute to win it game. Physics learning game, suitable for online classes and interactive lessons. Fun physics educational game to explore and study the orders of mass magnitude with pictures. Part of the Interactive Physics Workshop educational tools. Online physics educational game. 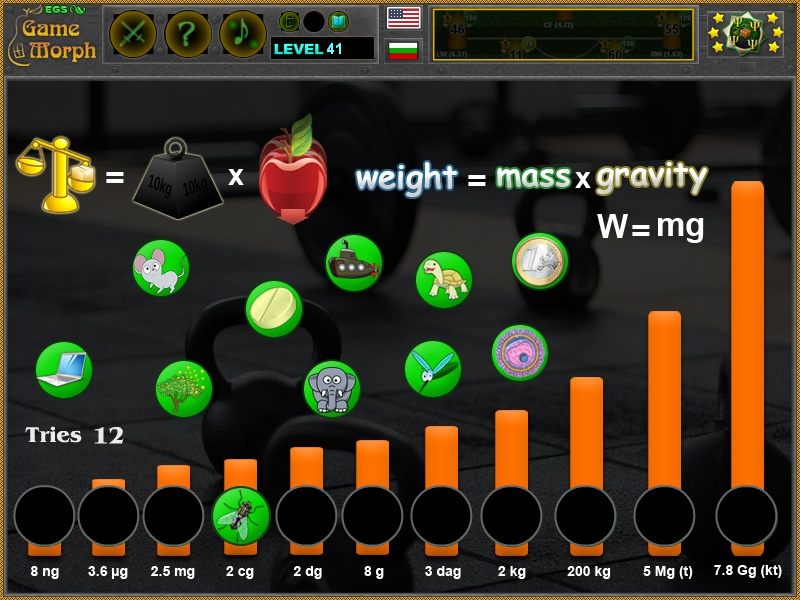 To understand the metric system of measurements of mass used in this game, play the Units of Mass Game. How to play Weight Comparison. There are 11 round pictures of objectas with different weight, which will appear randomly on the game screen. Drag and drop them in the correct slots according to their approximate mass value, situated at the bottom of the screen. Sort all 11 objects correctly to win the game. Know the mass of at least 3 things and get +1 Knowledge Level. The weight is equal the mass of an object multiplied by the gravity of the planet. That means that things will weight more on Jupiter. The heaviest manmade object on Earth ever directly weighed was the RevolvingService Structure (RSS) of launch pad 39B at NASA's Kennedy Space Center, Florida, USA. The structure was lifted up on 21 jacking points which, between them, measured the mass of the RSS as 2 423 tonnes. The heaviest object in the Universe is probably the biggest star. And the lightest things we know of is the basic particle of the atom nucleus. What is the weight of a mosquito? Which is the heaviest thing in the Universe? What is the heaviest object on Earth? What is the basic formula for weight? What is simple weight formula? What is the weight of one euro coin? What is the lightest thing? Labels: Physics Games , Puzzle Games , Comparison Games , Classroom Games , Education Games , Free Online Games.